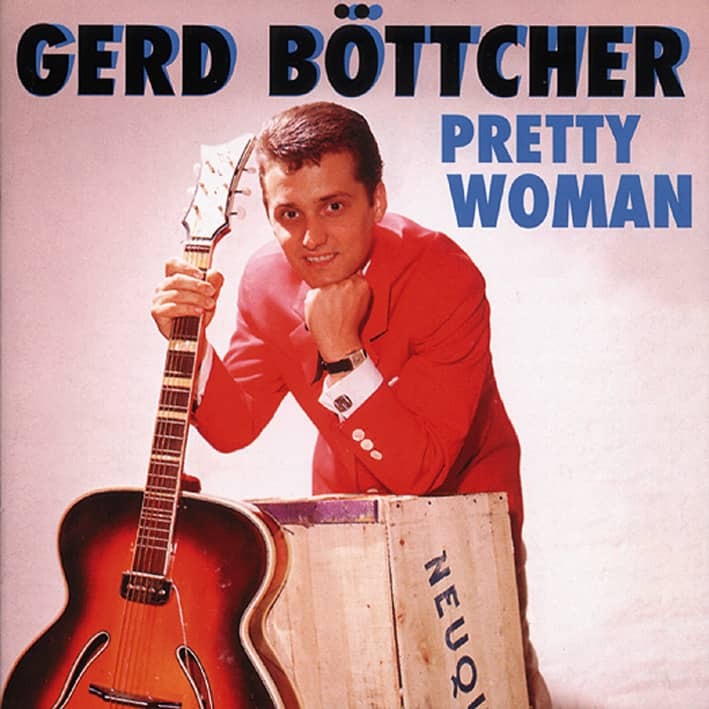 In the early 60s Gerd Böttcher was one of the most successful and popular singers on the German hit market. With his debut single Jambalaya the likeable Berliner made it into the charts. Before Werner Müller discovered him for the record, he had been playing in Berlin clubs for years and had occasionally worked as a singer in Hans Karbe's orchestra. From now on, however, it happened one after the other. With titles like Adieu, Farewell, Goodbye, A Dozen and're Men or For Gaby I do everything he earned money like hay. That was one of his greatest hits. Including Böttcher's duet recordings with Detlef Engel, he brought more than 20 titles to the charts from 1960 to 1967, including six top 10 hits. 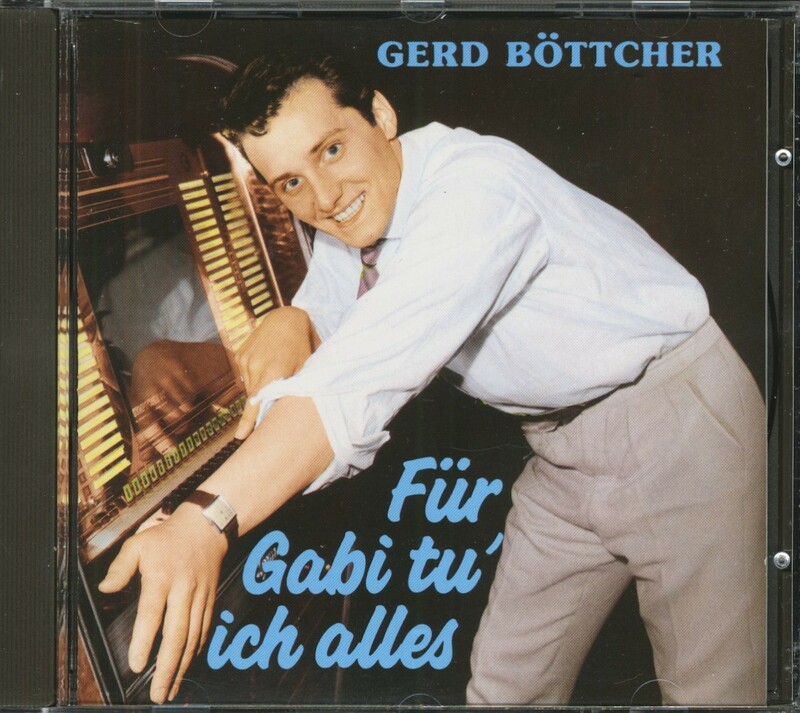 But like so many record stars, Gerd Böttcher's career is going up and down. Already in the mid-sixties the sales figures of his singles leave much to be desired. Hard times are dawning for the former guarantor of success, who seemed to have leased the success. Even international hit parade racers by Roy Orbison or Tom Jones, which he sings in German, prove to be flops. Decca, where he was signed at that time, now has a new driving force with Drafi Deutscher and is no longer interested in a further cooperation with Böttcher. After two years of abstinence from hit parades, Gerd Böttcher was almost forgotten. With the 1966 beat hit Schenk mir dein Vertrauen, which the Polydor released, Gerd Böttcher was able to achieve another sales success. But the next record is hardly noticed by the record buyers, and the company refrains from further releases. 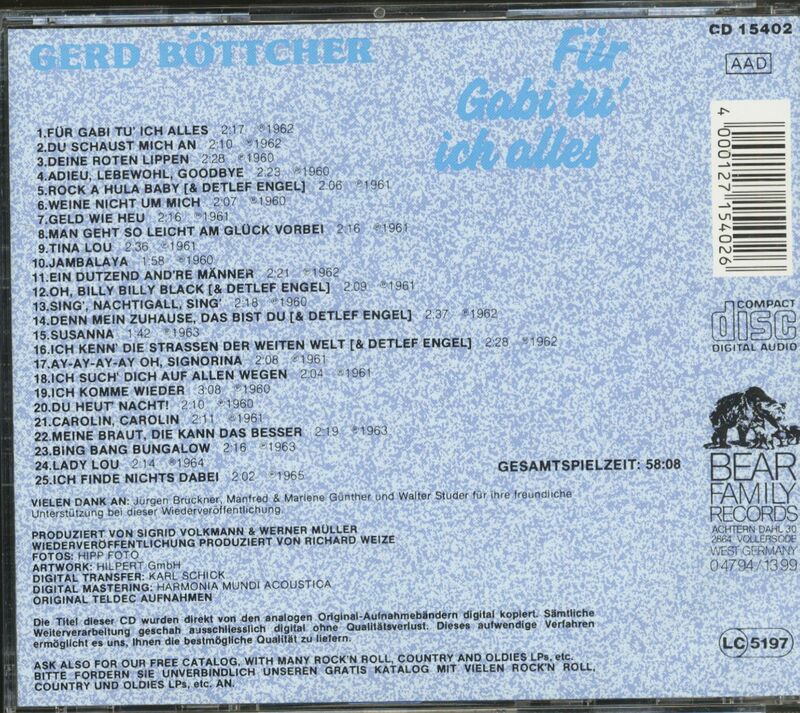 But with only 30 years Gerd Böttcher is far from old iron, especially since he is still an excellent singer. Berlin's Hansa - founded in the mid-sixties by brothers Peter and Thomas Meisel - concentrates primarily on young up-and-coming talent, but Gerd Böttcher also gets a new chance here. From now on the composer and arranger Dieter Zimmermann takes care of him. He is several years younger than Böttcher and can just record his first major hit parade successes as a lyricist, e.g. for Rex Gildo. Under the pseudonym Cliff Carpenter he also releases instrumental versions of well-known hits for the LP series'Hits For Dancing'. In selecting suitable titles for Gerd Böttcher, he takes a step in a new direction, because he realizes that his voice is made for emotion and romance. Although this genre is already very profitably served by Germany's pop idol Roy Black, Böttcher has also found a new recipe for success with this orientation for the time being. In August 1967 Sag mir noch nicht Gute Nacht entered the bestseller lists and reached number 25, and in the same year he was awarded another chart rating with Romantic Hours. But then even the soft wave will hardly make a commercial contribution. Not even with Long John Baldrys ballad Let The Heartaches Begin, which was a No.1 success in Great Britain and in the German version When the longing begins means he can conquer a place in the hit lists. 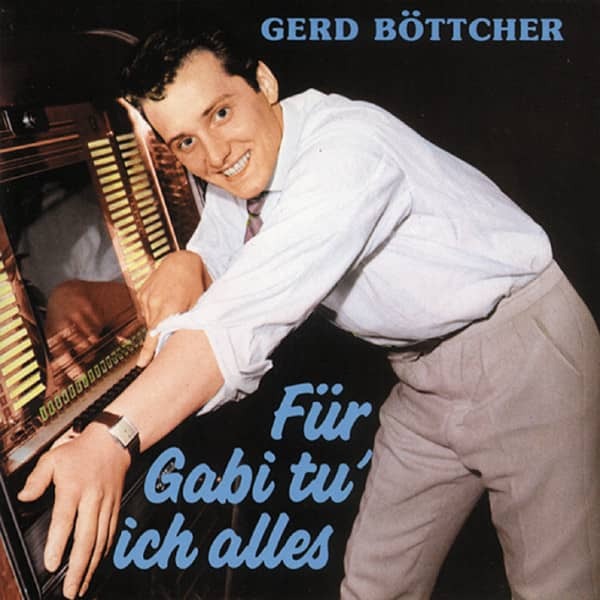 However, Gerd Böttcher is not an isolated case. Other hit stars, who celebrated great success at the beginning of the 60s, are no better. Whether Bill Ramsey, Gus Backus or Billy Mo - they all still release records, but have long since ceased to play a role in sales statistics and merely live off their former glory. And yet they are all waiting to be lucky again with the right song at the right time. When his contract with Hansa is not extended after five singles, Gerd Böttcher does not have to take a compulsory break this time. Dieter Zimmermann continues to look after him and as a man with many contacts he finds a new record company in Hamburg's Metronome. You experiment a little, try singing along with mood numbers like Der Gassenhauer or Die Bremer Stadtmusikanten, but then switch to modern pop songs. Reason: Most of the record buyers are recruited from young people, and the singer is now performing in many discotheques. Most of the titles are written by Zimmermann himself, but aspiring authors such as Giorgio Moroder or Chris Juwens also provide the interpreter with contemporary pop creations. The Metronome even manages to get Gerd Böttcher into the popular ZDF hit parade. For the singer, who has been neglected by television for years, this is finally a glimmer of hope again. On October 18, 1969 he presents his current title Grand Prix to Dieter Thomas Heck. However, the competition is fierce, because other new introductions include renowned colleagues such as Rex Gildo, Vicky and Peggy March. And Chris, the darlings of the audience at the time. Customer evaluation for "Für Gabi tu ich alles"